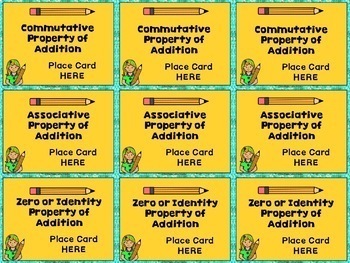 Use this math resource to get your students to think critically about the Commutative, Associative and Zero or Identity properties of Addition. 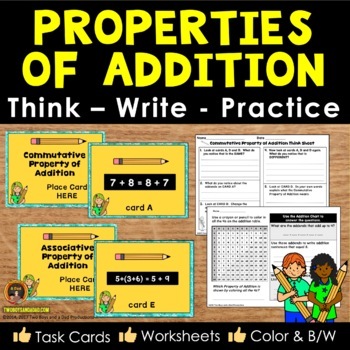 Use this in small groups, a whole group, guided math or in a math center. 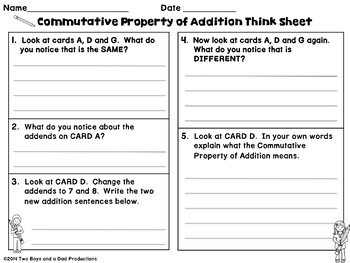 ★ students use a think sheet to explain the differences and similarities between number sentences for each property and explain the concept of each property. A review sheet is also provided for students to review before beginning. 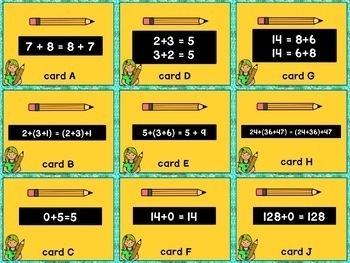 Included are Answer Keys. Put the printed instructions for the students, answer keys and recording sheets with the cards in a center. Black and white versions of the cards, example cards, and work mat make for easy duplicating for a whole group or cooperative group lesson. ★ Flap-Book to use as a culminating activity, assessment or homework. Use the CUSTOM CATEGORY Addition Properties to find additional resources for the Properties of Addition. Comments, suggestions, feedback, and questions always welcomed! ♦ Be sure to click on the green ★ to follow me for updates and new product announcements! ♦ Each time you give feedback, TPT gives you feedback credits that you use to lower the cost of your future purchases. I value your feedback greatly! ♦ If you have any questions or concerns, go ahead and contact me through the Q & A and I’ll get back to you ASAP!